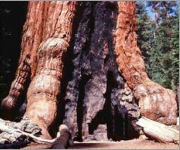 Sequoiadendron giganteum, also named, Sequoia gigantea, the Big Tree, Sierra redwood and Giant sequoia, is the world's largest tree in terms of circumference and volume. It is also a very long-lived tree in the wild, specimens have been found that are 3500 years old. It grows in more or less isolated groves on the Western slopes of the Sierra Nevada in Central California, in a narrow belt approximately 260 miles long. This species has the most massive trunk in the world. Fairly fast growing in height, increase in girth can be spectacular, 7-10 cm a year being the average. The bark is very thick on large trees, 1 to 2 feet, reddish-brown and deeply furrowed with large rounded ridges, fibrous. It is in leaf all year, in flower from March to April, and the seeds ripen all year. The foliage is bluish-green, hard and harsh to the touch. Branchlets are clothed with short, overlapping, scale-like leaves with sharp points. The scented flowers are monoecious, individual flowers are either male or female, but both sexes can be found on the same plant. The cones take 2 years to mature. In its native habitat the cones are retained on the tree with viable seed for up to 30 years. They open after the heat of a forest fire.